Borosilicate glass will not wear down over time, but calcium and magnesium in tap water can leave (unharmful!) off-white marks on the glass. If your dishwasher is not able to remove these marks, we have a few tips to make your Retap Bottle shine like never before. Retap tops are very unique as well. They do not leak! 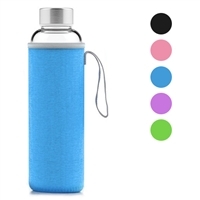 Stick them in your handbag, backpack or briefcase and do not worry that you will find a pool of water at the bottom like so many of the tops of other bottles. Retap tops are made of thermoplatic elastomers (TPE) which are completely safe. Further, when you actually drink the contents, you only ever touch glass. Our tops fit nice an snug. They will not accidentally 'pop off' and you can take them off easily especially when there is a little liquid in the bottles. One of the main features of the Retap Bottles is that they are designed to keep your tap water clean - Glass cannot pollute your water, unlike plastic; The bottle is designed without edges where bacteria could grow; Retap Bottles can easily be cleaned in a dishwasher. Wash your Retap Bottle and lid before use. Don't leave water in a Retap Bottle when it's not in use. It increases the change of calcium remains. Rinse the ReTAP Bottle with tap water before refilling. Use vinegar to remove calcium remains. You can use it pure and shake it around with a lid on the bottle or you can mix vinegar with water and leave it overnight. If you clean the ReTAP bottle by hand: use a bottle brush. They are available in most shops with household appliances. Our bottles are made from borosilicate glass: a highly durable and qualitative material that lasts and withstands most impacts.